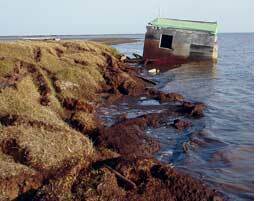 THE rate of coastal erosion in the Arctic is one of the highest in the world. It has doubled over the past 52 years and is accelerating. This spells trouble for communities living by the shore such as the Shishmaref in Alaska and the Tuktoyaktuk in Canada. Researchers studied the Arctic coast and found that reduction of ice cover has increased the rate of erosion. Benjamin Jones, a geologist with the US Geological Survey in Anchorage, Alaska, and his colleagues, examined aerial photographs of a 60 km segment of the Alaskan Beaufort sea coast taken between 1955 and 2007. They found the mean annual erosion rates had increased from 6.8 m (1955 to 1979) to 8.7 m (1979 to 2002), to 13.6 m (2002 to 2007) per year. The researchers also observed that the rates of erosion depended on the ice-cover of the areas. The areas with thinner ice-cover had higher rates of erosion. Soil erosion causes changes in the area's organic carbon content. This could induce changes in the local food webs and eventually affect the Arctic Ocean carbon cycle. "Reduction of Arctic sea ice cover leads to greater open-water area available to the wind to form waves. This increases wave heights during storms which affect the coast," explained Hugues Lantuit, a geomorphologist from the Alfred Wegener Institute for Polar and Marine Research, Germany. All these factors may lead to a new pattern of ocean-land interactions that will reshape the Arctic coastline, said the researchers in the study published in the February 14 issue of Geophysical Research Letters . "Coastal environment is changing rapidly, possibly as a consequence of human activities," said John Farrell, executive director, US Arctic Research Commission.